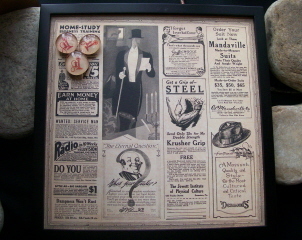 I am just starting to add some home decor items. Since home decor is such a personal taste I love to work with you to make something that goes well in your home. Email me if you are looking for a certain theme or color scheme and I will see what I can come up with. This is perfect for a little girl’s room. It measures 3 1/2 x 12 inches and has two knob hooks on it. You pick the letter you need and tell me the theme or color scheme that you are looking for and I will create a letter working with your ideas. I do individual letters or whole words. Email me for more info. 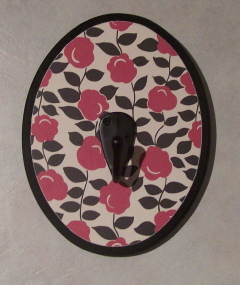 This is a 9 x 7 inch oval wall hook with one hook on it. The red and black color scheme will add great style to any room. This is a 12 x 12 magnetic message board. It can either be hung on the wall or stand on a counter. It comes with 3 coordinating magnets. This is a great way to keep your messages organized while still be a great art piece when empty. ***$6 of this price is for the additional shipping and handling costs on top of the regular shipping cost. This is a 12 x 12 magnetic message board. It can either be hung on the wall or stand on a counter. It comes with 3 coordinating magnets. 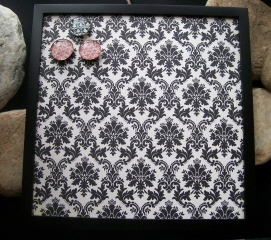 The black and white damask is so stylish. This is a great way to keep your messages organized while still be a great art piece when empty. 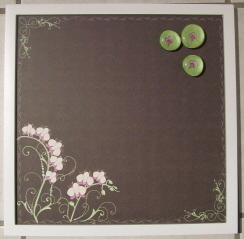 This is a 12 x 12 magnetic message board with 3 coordinating magnets. It can either hang on the wall or stand on the counter. Great way to keep track of messages but also have a great piece of art when empty.